See more objects with the color darkkhaki palegoldenrod darkslategrey darkgrey dimgrey or see all the colors for this object. This is a Sidewall. It was manufactured by F. Schumacher & Co.. It is dated 1952–53 and we acquired it in 1954. Its medium is screen printed. It is a part of the Wallcoverings department. 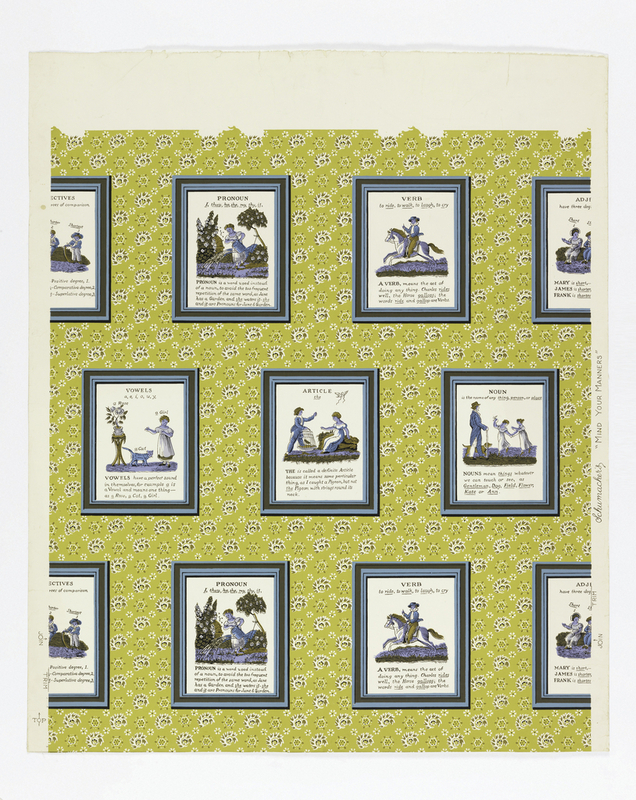 Wallpaper designed in the manner of print room wallpaper, popular in the mid-eighteenth century. The rows of frames contain simulations of pages from a children’s book of grammar, giving lessons on nouns, vowels and verbs. The repetition or massing of similar objects was a popular convention of the 1950s.